The Octagon’s fifth show in as many weekends goes down Saturday inside American Airlines Center in Dallas, Texas. 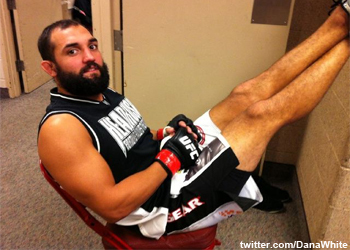 UFC 171 features a shootout between Johny Hendricks (pictured) and Robbie Lawler. The welterweights battle for the vacant title now-former champion Georges St-Pierre voluntarily relinquished to take a break from MMA. Former interim champ Carlos Condit looks to earn another crack at the crown with a win over Tyron Woodley in the co-main event. UFC Fight Pass kicks off the live action by streaming the night’s first four fights at 6PM ET/3PM PT. Fox Sports 2 will then air the remaining four prelims at 8PM ET/5PM PT. The pay-per-view broadcast begins immediately after at 10PM ET/7PM PT.